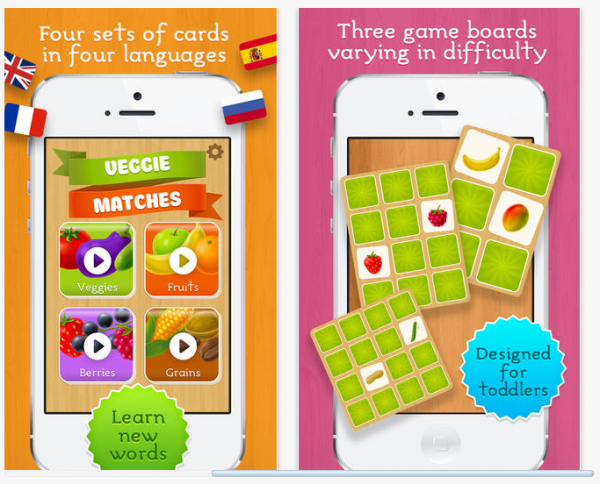 Veggie Matches — cards for training brain and learning words for toddlers, developed by Beenza Games, is a fun and educational card matching game designed for 3-6 year olds. I was baby sitting my niece and needed some ideas to keep her busy. I know she loves playing with the iPad, so I decided to try and find some games she may like. Veggie Matches seemed like the perfect match because she loves the iPad and she loves to eat veggies. As soon as I showed her the basic concept of the game she was quickly matching the correct cards and repeating them every time. She even learned about new veggies and fruit that she has never heard of or tried. Veggie Matches has the difficulties and for sets of cards including, Vegetables, fruits, berries, and grains. It also offers very soothing and easy to understand voices to help children learn the correct pronunciation. My brother was surprised that I was teaching my niece educational material instead of letting her play the more violent games that are on my iPad. If you are looking for a simple game that toddlers will enjoy playing for hours all while training their memory and teaching them new words, Veggie Matches is a great app to download. It currently costs just $0.99 and is available on the App Store now. Go check it out.